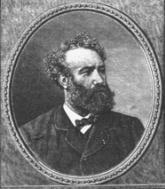 Jules Verne was a French author of the late 19th century who is regarded as the father of science fiction. He was born in 1828 in Nantes and studied law in Paris, where, to the displeasure of his father, he developed a passion for theater. His first play was published in 1850, but he was not very successful until the publication of his story “Five Weeks in a Balloon” in 1869. Verne spent a long time in Paris libraries researching everything from astronomy to engineering as a foundation for his fantastic adventure stories. Because of the 19th century interest in science and invention, his novels, such as JOURNEY TO THE CENTER OF THE EARTH, FROM THE EARTH TO THE MOON, and 20,000 LEAGUES UNDER THE SEA, became extremely popular. During his life, they brought Verne wealth and allowed him to buy a yacht and sail around Europe. They also began the science fiction tradition by predicting 20th century advances such as space flight and submarines, and are still widely read today. The adventures of a French professor and his two companions who are prisoners on the electric submarine of Captain Nemo. Phileas Fogg, Thomas Flanagan, Samuel Fallentin, and John Sullivan are members of the Reform Club. Passepartout enters the club, looking for employment, and is hired by Fogg. Fogg accepts a twenty thousand pound bet that he cannot travel around the world in eighty days. The tale of a group of adventurers who set out in a unicorn-shaped balloon on a trip across the African continent. Barbicane and members of the Baltimore Gun Club plan to travel to the moon in a gigantic cannon. Sequel to "From the Earth to the Moon" in which Barbicane and his friends begin their trip around the moon.